Mom's Gone Bronson! 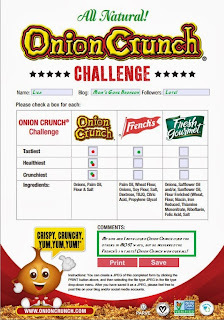 : The Onion Crunch Challenge! O.K. Hands up! Who doesn't like crunchy onions!? We certainly LOVE them in our house and so when Onion Crunch asked us to take part in the Onion Crunch Challenge we just couldn't say no! We taste tested 3 different kinds of crunchy onions today and, while I love them all, one did turn out to be a little bit of a winner over the rest! We tried Onion Crunch, French's French Fried Onions and Fresh Gourmet Crispy Onions and I tasted them along with my son! We had a sheet to fill out based on tastiness, crunch and ingredients and they all had something to offer, for sure but the Onion Crunch has a slight advantage that the ingredients are simple and sound! We do love them all, all three were indeed good, but the basic goodness of Onion Crunch did do it for all of us! My son, however, did prefer the taste of French's over Onion Crunch - his are the green dots in the boxes on the test sheet and mine are the red! We didn't know which onions were which while tasting, we had a friend help us out so that we tested them fairly and once we did the test, the results were marked down! The Onion Crunch clearly won 5/1 on our score sheet and you can see why! - They taste great, they have a ton of crunch and the fact that there is so little to them ingredients wise means the world! - Crispy, Crunchy, Yum, Yum, Yum! We moved on in the afternoon to make a dish with the Onion Crunch, which was based on something we all have at our place for Thanksgiving - Mac and Cheese! You might not all have Mac and Cheese, but we certainly do because our children are picky eaters and so I thought it would be great to put a twist on it with the Onion Crunch! I baked up a little pasta until it was halfway cooked, added white sauce, which consisted of a half block of 2 different cheeses that were grated and a little cream and seasoning, put the two together and covered in grated cheese and onion crunch on top for that added "umphff". When baked, the kids tucked right in and it was a big hit! I really think that if you love crunchy onions you're going to love to put them on just about anything OR even crunch on them a little on their own!! I would love to hear from you if you have tasted any of any of these products and what you made of them!? 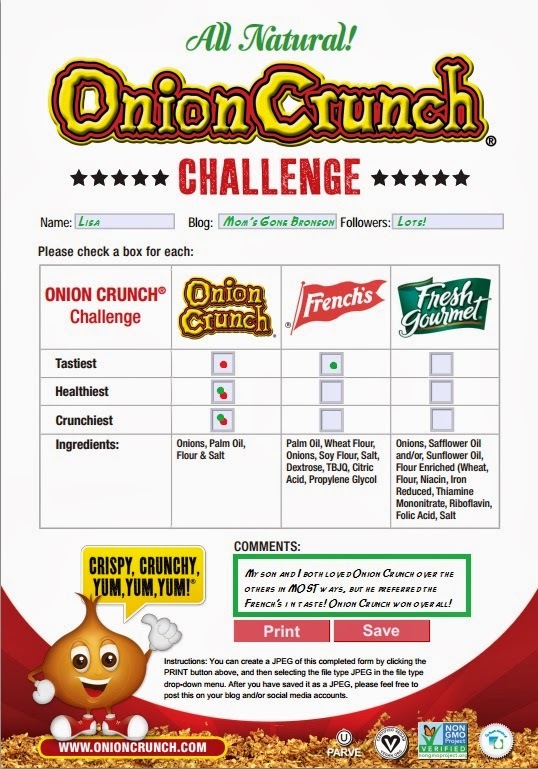 How did you like Onion Crunch fair with the others and would you be willing to take the Onion Crunch Challenge!? We would all love to see what you think! Disclaimer: Onion crunch provided us with the necessary products to take part in this challege! Our views are 100% honest and our own. Your views may differ! Thank you!